We’re right in the middle of winter, which means it’s snow season here in Iowa! My kids love it, especially when they can go out and play in the snow! 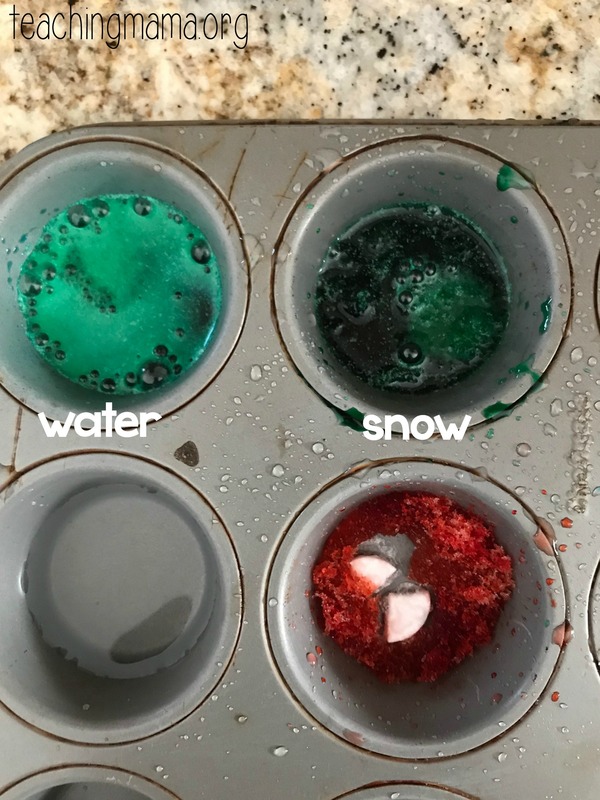 I’ve been doing snow activities with my preschooler and I’m excited to share with you what we’ve been up to! You can read below to see what we’ve been doing and grab the free printables! 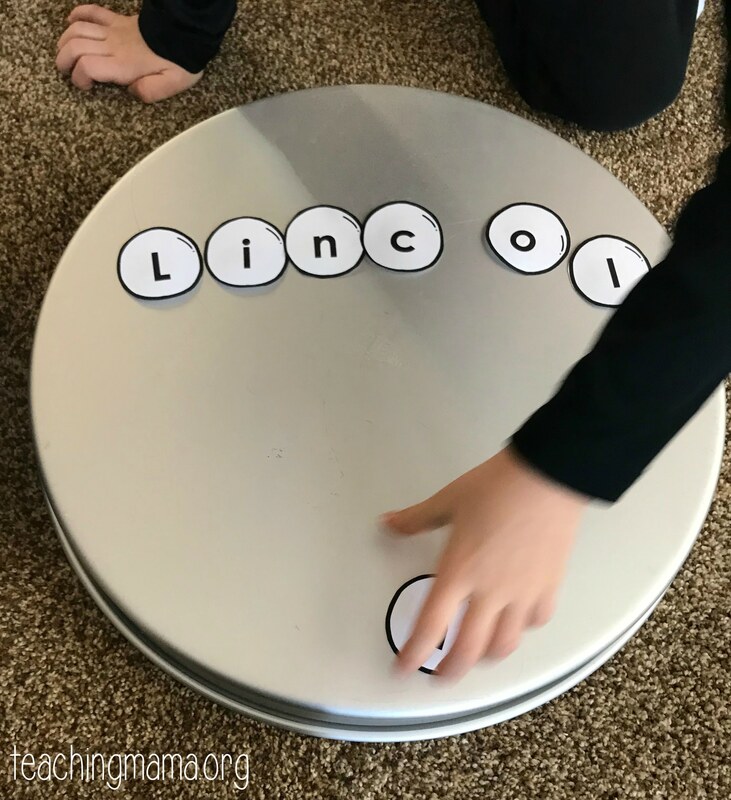 An important skill for preschoolers to work on is recognizing alphabet letters. I created a printable and fun activity to help these little ones learn alphabet letters and even spell their name. Download THIS PRINTABLE and open it up in Adobe Reader. 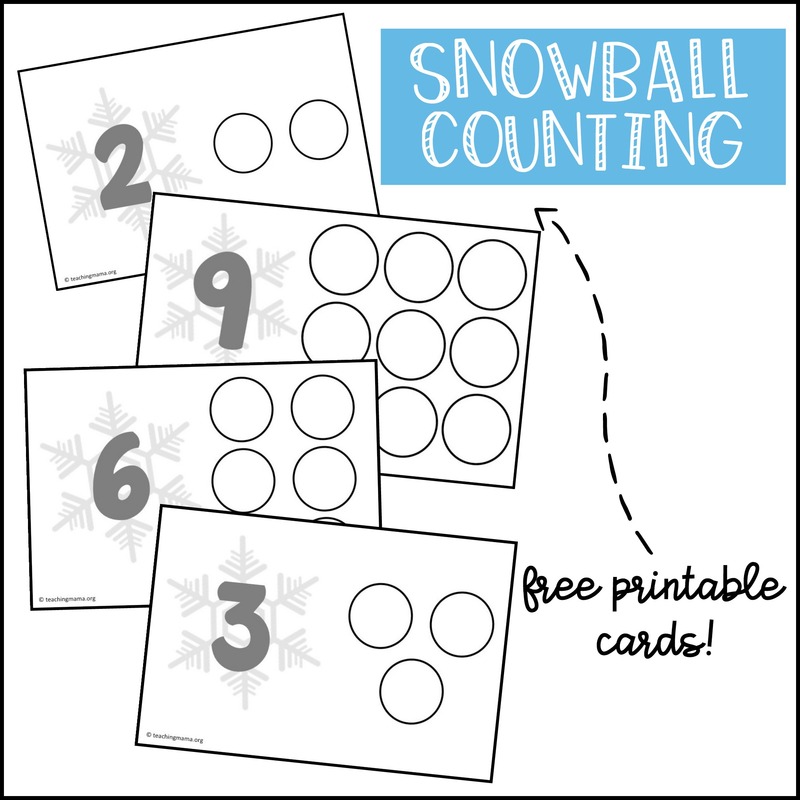 This printable is editable, meaning you can customize it so the snowballs spell your child’s name. 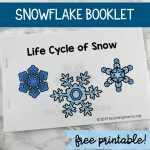 On the last page of the printable, there is a page with empty snowballs. When you open it up in Adobe Reader, you should be able to see blue boxes on the snowballs. Click on the blue box and type in a letter. After you’ve customized it, you can print it. If you don’t feel like customizing the printable, there’s also an option to print the uppercase or lowercase snowball letters. 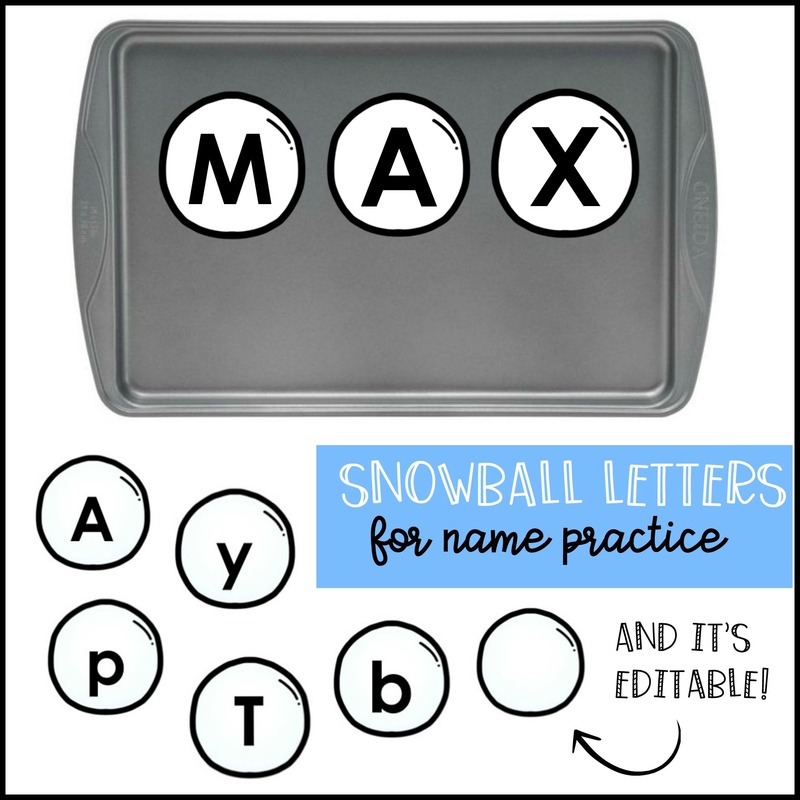 Cut out the snowball letters and glue a magnet to the backside. Practice arranging the letters to create your child’s name. 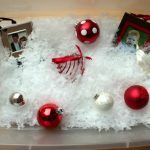 You can place it on a magnetic cookie sheet, refrigerator, or something similar. This is a fun sensory activity, as well as a great way to practice beginning writing. It’s really not snow we’re using, just shaving cream! 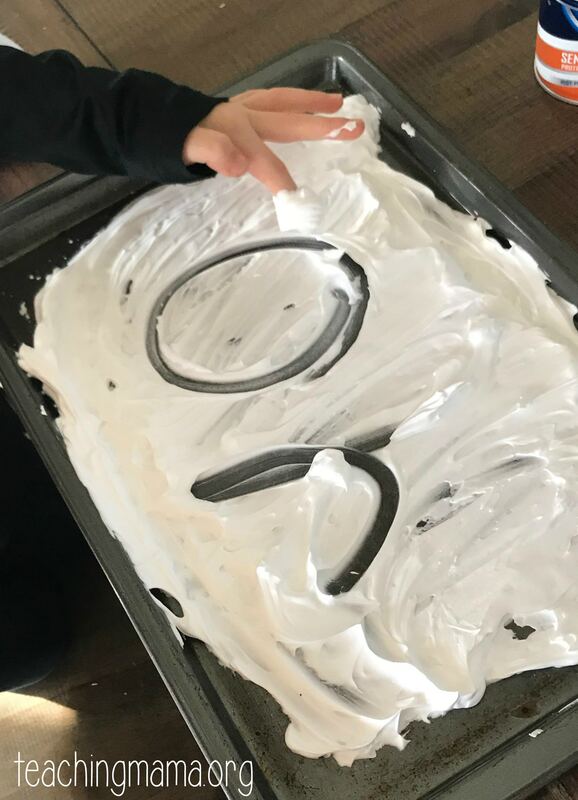 I wanted a fun activity to practice letter and number formations, so I used shaving cream on a tray. You don’t need a lot, but just spray the tray and smooth it down with a spatula. Then have your child practice writing out letter or numbers. You may want to check out my winter alphabet handwriting sheets to help your child learn to write letters with the correct formations. For this activity, children will be counting and working on one-to-one correspondence. Print off THIS PRINTABLE and cut the sheets in half. Mix them up and set them in a stack. Set a pile of cotton balls next to the sheets. 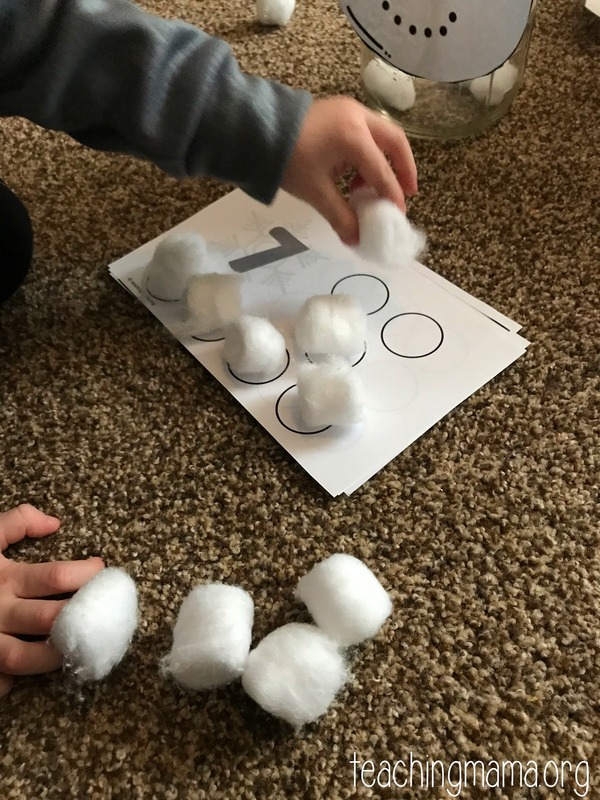 Have your child find a counting sheet, match the cotton balls to the circles, and count them up. Then pour the cotton balls into the clear container. Continue playing until all the cotton balls have filled the container. 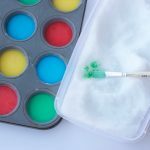 If you have a child who is in advanced in math, have them count how many cotton balls filled the container! 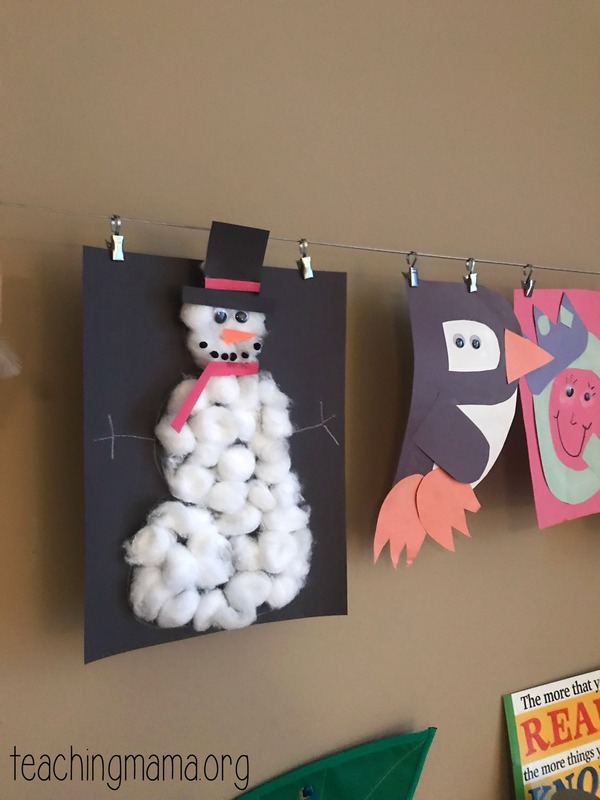 I love this cute craft and I know your preschooler will, too! Begin by having your preschooler pull apart about 30 cotton balls. This is good for fine motor skills, too! 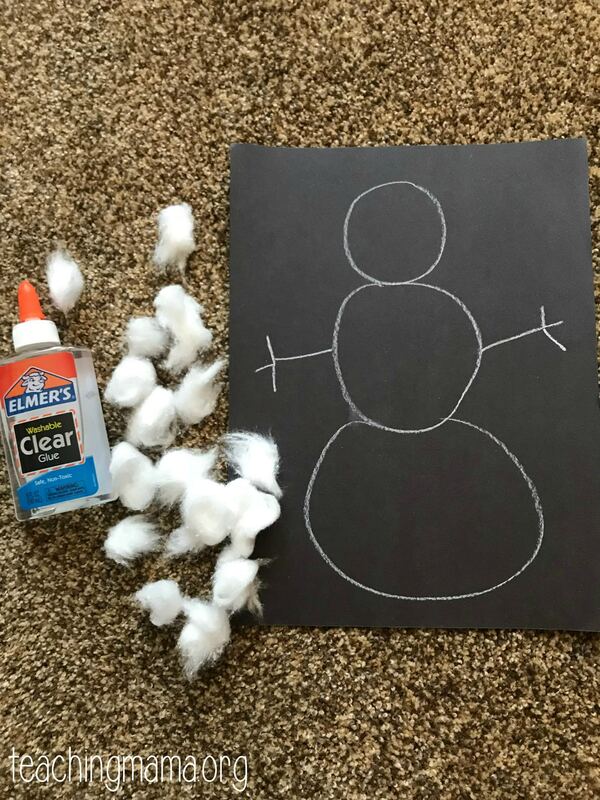 Draw the snowman outline with chalk on the black paper. Also draw the stick arms. 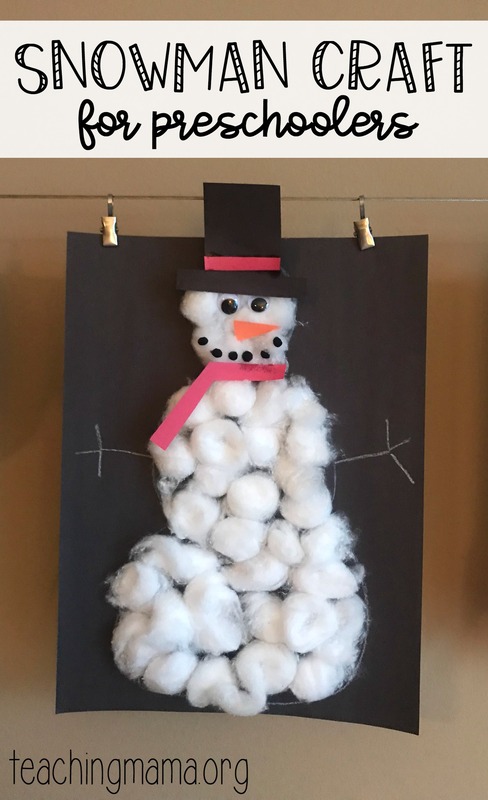 Have your child squirt glue onto one section of the snowman. Place the cotton ball pieces on the glue. Keep doing this until the snowman is filled. Glue on a red paper scarf around the neck. Glue the hat to the top of the snowman. If it starts to flop back, glue a small cotton ball behind the hat. Hang it up for all to see! To set up the activity, fill the stocks with either rice or beans. Then tie them off. They should look like the shape of a snowball. Set laundry baskets across the room. Practice tossing the “snowballs” to the basket. Other variations include tossing it up and catching it in their hands or tossing it to a friend. Snowball, snowball, white and round. It was formed right from the ground. Watch it land right over there! On the last line of the chant, throw the snowball to the laundry basket. 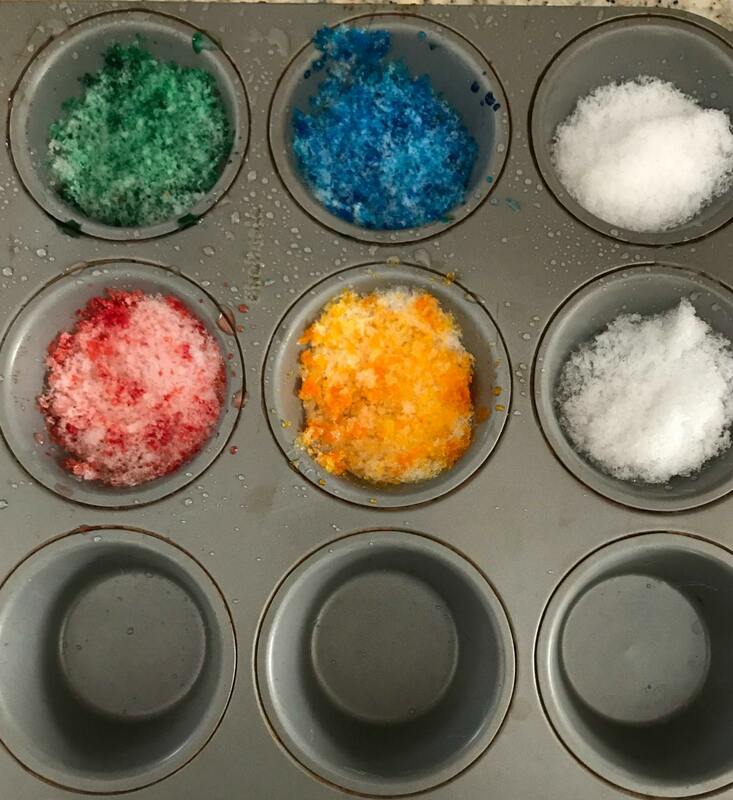 Begin by filling half of the muffin tins with snow. 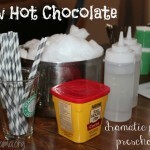 Add a few drops of food coloring to the snow and stir. Add water to the empty containers. You can also add food coloring, if you’d like. 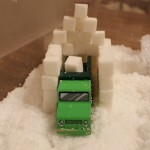 Then place an Alka Seltzer tablet into one compartment with snow and one compartment with water. Observe what happens. You’ll see that the one with water dissolves MUCH faster than the one with snow. It shows that when things are cold, the reactions are colder. This is a simple experiment, but it demonstrates how temperature affect the rate of the chemical reaction. When the liquid is warm or room temperature, the reaction is quick. When the liquid is cold, the reaction is slower. 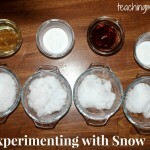 If you are interested in more winter science experiments, check out this science packet! 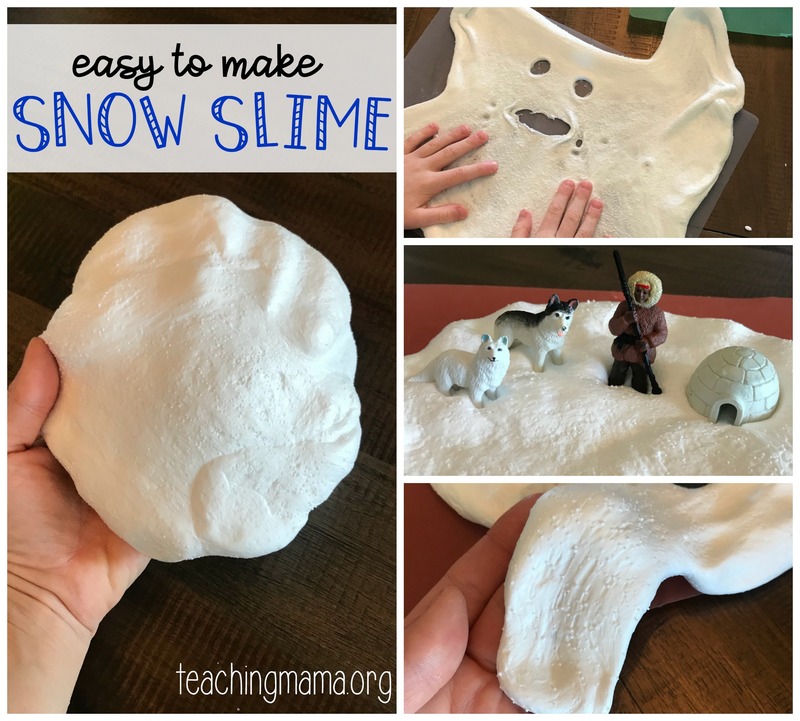 We’ve been playing with this slime all winter! It’s been our favorite! To read how we made it, visit this post. Do your kids like to sing? Mine sure do! 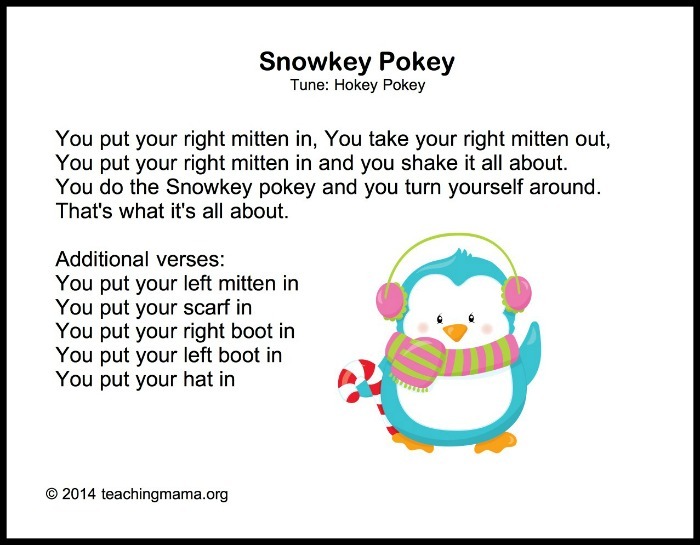 I have some fun printable songs over on this post that are easy for preschoolers to learn! 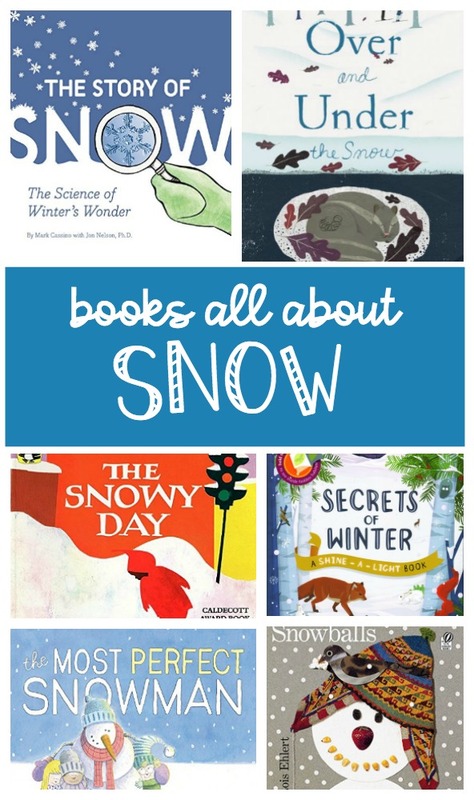 Here are our favorite books we’ve been reading about the snow. 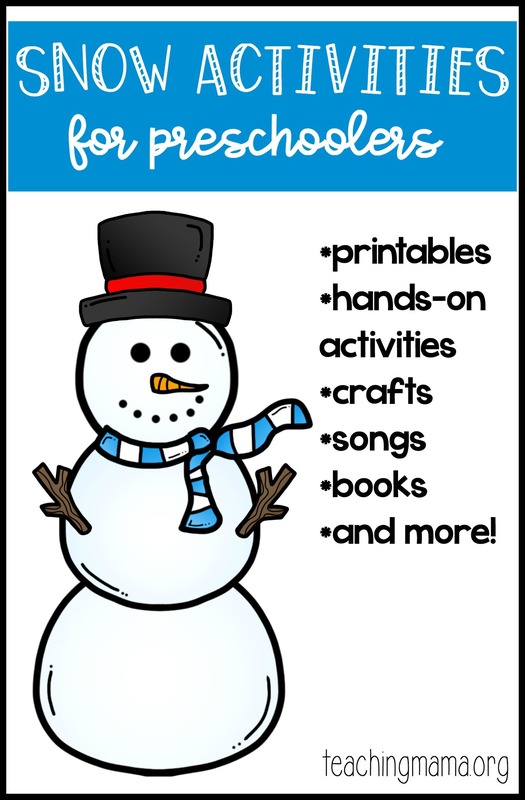 I hope these activities are helpful to you if you’re planning a snow theme. I’d love to hear what your favorite snow activities are!